Murg Saagwala simply means chicken with spinach. The flavor that the fresh spinach lends to this dish, is unique! It is a popular entrée in many Indian restaurants. I wanted to streamline this recipe so that it is super easy for a home cook like me. I eliminated the time consuming steps of frying and grinding the onions and spices. Also I used store bought garam masala and everyday common spices like coriander and cumin seed powders. Many times I will put off making a dish because I find the marinating step to be tedious. This recipe has very few ingredients in the marinade plus I marinated the chicken the night before and put it in the refrigerator. So it took me less than 15 minutes to put this dish together the next day. 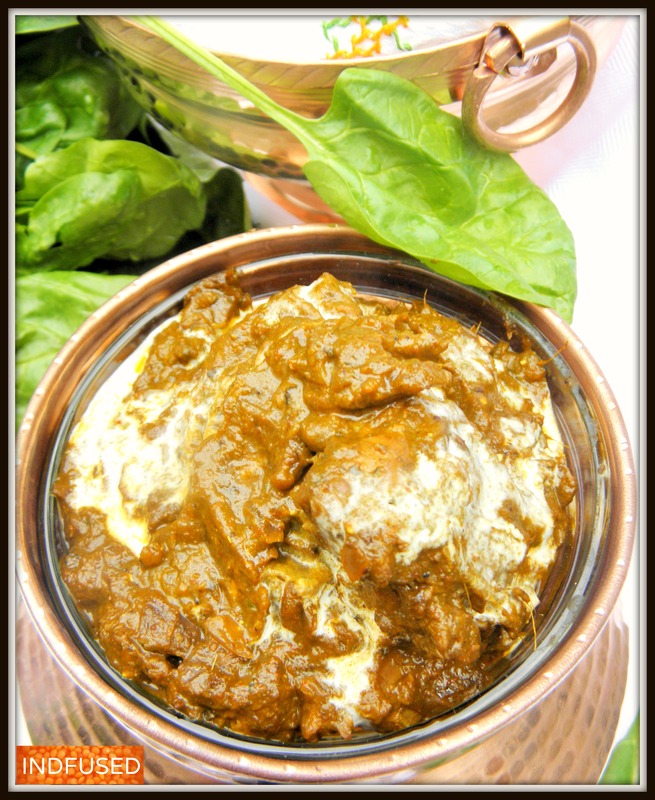 In some restaurants, this is one of those dishes that can be heavy with oil, ghee and cream. Mine is a much lighter version without compromising on the taste, of course! Do let me know how you like this Murg Saagwala. I serve it with the Figure friendly dal methi paratha and the Bejeweled Basmati Rice. ½ teaspoon garam masala powder. I used the MDH brand. In a stainless steel or glass bowl, mix together the grated ginger root, garlic, turmeric and chili powders and the salt. Add the chicken pieces, coat well with the marinade and set aside for a minimum of 30 minutes or overnight in the refrigerator. Heat the 2 tablespoons of oil in a sauce pan over medium heat. Add the finely diced onion, pinch of salt and the brown sugar. Stir fry the onion until is caramelized- about 2 to 3 minutes. Turn down the heat, add the red chili powder, the coriander seed and cumin seed powders and the garam masala powder. Give it a quick stir to ‘wake up the flavors’ and add the tomato paste. Stir fry on low for a minute or so and add the ½ cup of water. Stir, cover and let the mixture cook on low heat, until it is fragrant, about 3 to 4 minutes. If the mixture sticks to the pan, add a tablespoon or so of water. Uncover the pan, add the marinated chicken and stir to combine. Stir in the 1 ½ cups of water and salt, cover the pan and cook on medium heat until the chicken is cooked through, about 5 to 7 minutes. Mix in the spinach puree and cook an additional minute or two to let the flavors mingle. Add the heavy cream (if using) stir and remove from heat. Serve with chapatti, dal methi paratha, naan , white or brown rice or the Bejweled Basmati Rice. Thanks. this is a quick and easy recipe but tastes yummy. Let me know if you like it. Oh yes. You have triggered my taste buds and they wouldn’t rest till I get them to taste this yummy dish. This sounds a great recipe! I would love to taste it. Not sure if I can make it tonight..but maybe some day this week! Thanks and bookmarked! Thank you Indah! Do let me know how you like it. Just Pinned this…Yum! Can’t wait to try! Thank you so much! Do let me know how you like it. With fresh tender green spinach in the market these days, I am making it again and again.